Arizona Trail Expeditions is a division of Hermosa Tours, LLC located in Sedona, AZ. Hermosa Tours was founded in 2007 in Durango, CO and we have operated tours throughout the western US since that time. AZT Expeditions is new program offered in partnership with the Arizona Trail Association with the goal of supporting multi-day expeditions for mountain bikers, hikers and trail runners along the 800+ mile Arizona National Scenic Trail. Arizona Trail Expeditions trips will be largely operated as “self-guided” adventures. Hikers, riders and runners are responsible for guiding themselves down the trail and cooking for themselves at camp. Arizona Trail Expeditions meets them at predetermined camp locations along the trail with a deluxe kitchen, water, chairs, firewood, their personal gear and other amenities. At the core of our mission is a love of the Arizona National Scenic Trail. Stretching from the Mexican border to the south to the Utah border to the north, the ANST is one of the most diverse and special trail resources in the entire country. Proceeds from your trip go to the ATA and we as an organization are committed to maintaining the trail. 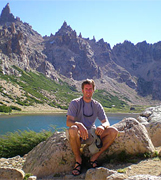 Matt is the Founder and Director of AZT Expeditions and every once in a while gets to guide. He is an Arizona Trail Steward for Section 14f near Antelope Peak which you can find him hiking and biking on. He was a chronically amateur endurance racer having completed several 24 Hour Solo races, 100 mile off road races and was stupid enough to be a near finisher of the Great Divide Race: a 2500-mile, unsupported mountain bike race from Canada to Mexico along the Continental Divide. My name’s Zach and I like all forms of two-wheeled mechanized contraptionry although I’ve been known to use my two feet to get around as well. I’ve been riding and hiking the trails in and around Durango since I was a kid, and I never get tired of the endless variety of singletrack we have here in SW Colorado. My other hobbies include skiing and finding jobs that pay me to drive around in the woods. Any day outside on the trail is a great day; let’s get out there and ride! My life revolves around riding bikes whether it’s up or downhill, dirt or street. When I’m not on my bike I’m kayaking, skiing, or fishing.I like bikes, a lot. Who wants to ride? How about a hike on the AZ Trail? You? All right, I’m cool with that, let’s do this! Let’s cut right to the quick, I love bicycles and I love being out on the trails. I started mountain biking in 1987 when I came to Fort Collins, CO for school. The trails offered serenity and peace that the dorms, understandably, did not. So I rode a lot, and soon names like “Moab, Crested Butte, Durango” were enticing me with promises of more and more single track. I more than gladly answered the call and soon Durango was not only an epic place to ride, it was home. After eleven years of traversing the backcountry I am still amazed at the beauty of the Arizona Trail and have begun exploring it more and more every year. 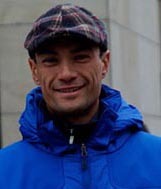 Will has been a roughneck, writer, cattle rancher, newspaper publisher, horse farmer, commercial fisherman, journalist and English/Arabic translator. There has been one constant in this wide-ranging life – the bicycle. Will’s likes include high alpine singletrack, titanium tubing, carbon-soled Italian footwear and desert sandstone. Among his dislikes are internal combustion, goatheads, tofu and Moab’s Easter Jeep Safari. He currently rides or hikes at least 5 days a week during every month of the year. My name is Jon and I am stoked! I moved to Arizona from Indiana in 2004 after school and as soon as I got here I fell in love with the Flagstaff/Sedona area and all the great riding and hiking this place has to offer. We have endless amounts of trail and every type of terrain imaginable. 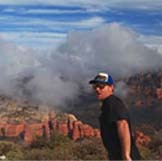 I started working as a mountain bike guide in 2008 and I learned that I love to get others stoked on mountain biking and hiking now on the Arizona Trail. Whether its your first ride ever or you’re seasoned rider we are gonna have a great time! So get stoked and lets go hit some trail! Life is a daring adventure, or nothing!! !